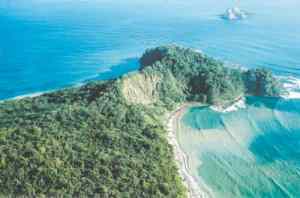 The Cabo Blanco Absolute Natural Reserve protects tropical forest and beach areas at the southern tip of the Nicoya Peninsula, Costa Rica. The San Miguel Biological Station of Costa Rica was developed to promote and support teaching, research, and environmental education, taking advantage of the well-protected tropical marine and dry forest habitats present on site. From San Jose, Costa Rica take the InterAmerican highway to Puntarenas. Take the ferry across the Gulf of Nicoya to Paquera, then drive through Tambor, Cobano and Cabuya. The Administration Station is 2 miles south of Cabuya. The San Miguel Station is located near Mal Pais, Costa Rica on the western side of the Reserve. Other nearby popular beach areas include Mal Pais, Santa Teresa, and Playa Tambor. There are trails that lead between the Administration Station and Playa Cabo Blanco, and Playa Balsitas and the San Miguel Station. Potable water and restrooms at both stations, picnic areas and showers at Playa Cabo Blanco. Camping permits are limited. Facilities at the San Miguel Biological Station include classrooms, laboratories and a reference library. Bunkbed lodging with electricity, shared rooms and baths is available for groups up to 30. For more information contact 645-5277 or 645-5890. The station is open to students, investigators, and any group interested in learning first-hand about these diverse, fascinating and increasingly threatened ecosystems. Costa Rica.